On February 2, former Buyende District Police Commander Mohammad Kirumira faced the police court to answer a number of cases all related to misconduct. First to pin the maverick police officer, the prosecution team, led by Ms Katherine Kusemereirwa, presented a witness Atuhaire Steven, alias Kalefu Sunday Robert who accused Kirumira of extorting Shs150,000 sometime in 2013. Drama broke out in the hearing when kirumira declined to cross examine the witness claiming that he was a ghost witness. Ms Kusemereirwa then asked court to detain Mr Kirumira, arguing that setting him free would lead to him tampering with witnesses. “Witnesses who have come here have told me that other witnesses are scared of coming here because first of all he [Kirumira] mistreated them and tortured them,” Ms Kusemereirwa told the tribunal, attended by senior police officers including police spokesperson Emilian Kayima. Kirumira dismissed the claims before court arguing that police was not allowing him the merit to prove himself credible. “There is no reason why the Flying Squad had to come to arrest me at 8:00am, before I had jumped court time,” Mr Kirumira argued. Kirumira was arrested on Thursday last week by the police Flying Squad. He was forcefully pulled out of his home in Bulenga after locking himself inside insisting that he could not allow to be arrested by Professional Standards Unit officers. The Police also fired live bullets and teargas to disperse residents who had gathered to see what was happening. The chairman of the police tribunal, Senior Commissioner of Police Dennis Ondongpiny, cancelled Mr Kirumira’s bail and remanded him. “Accordingly, his bail is cancelled and he is remanded at the Uganda Railways police facility until the next sitting of the court that will be Tuesday February 6,” Mr Odongpiny ruled, sending Mr Kirumira into a war of words with police officers who tried to detain him. A few days later, as she went Railway Police to visit her husband Mariam Kirumira was reportedly attacked last Friday by two assailants wearing sunglasses and T-shirts at Busega roundabout in Kampala. She said the attackers trailed her from her home in Gogonya, Bulenga in Wakiso District to Busega where they tried to pull her off a motorcycle but she was saved by the boda-boda rider who sped away towards a gathering of other people and the pursuers abandoned the chase. On reaching the police station, Ms Kirumira was informed that her husband had been moved to the notorious Nalufenya detention centre in Jinja. When PML Daily spoke to Mr Kayima about why police disregarded the instructions of their own court and moved Kirumira to Nalufenya, Mr Kayima said the police are free to detain its officers anywhere. “But this depends on the circumstances and the character of the person,” Mr Kayima said. Before his arrest, Kirumira went on different radio stations, exposing the rot in the Force. He said many unqualified people join the force and they are quickly promoted. 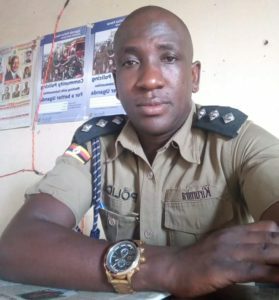 The embattled Kirumira, recently replaced as Buyende District Police Commander is expected this morning to reappear before the police disciplinary court. The hearing had been set for Tuesday but Police said it was postponed due to Tarehe Sita celebrations.